When my husband and I were first married we were on an extremely tight budget. We relocated from Ohio for him to go to a very expensive graduate school, and I had no job! Eventually, I got a job as a career counselor and student affairs administrator at San Diego State University. His tuition was about 1/3 of my gross salary. Fortunately, we had some savings to help with expenses. This story explains how we managed to invest on a small salary, and ultimately grew our initial investment over 6 times. My first introduction to the 403(b) was through my employer. I made the decision to contribute the maximum allowed by law, even though I knew we couldn’t live on the rest of my salary. I’d be lying if I said we didn’t miss the $800 per month retirement plan contribution, because we did. And we couldn’t have done this had we not saved up a bit during the previous years to help tide us over. Was this crazy or not? My thinking was, I would dip into savings in order to meet our living expenses if necessary, and we would live as cheaply as possible. Our entertainment consisted of pot luck dinners with our friends or happy hour at the local Tio Leo’s where one drink entitle you to a nice buffet of chicken wings, tacos, and snacks. That was our dinner. We rented movies for $1.00 at the video store (yes, back in the day, you had to go to a store and rent a movie). There were plenty of months where we dipped into our savings because we transferred $900 per month from my salary into our TIAA-CREF 403(b) and my gross salary was only about $3,000 per month. As my salary increased, I increased the account contribution to the maximum allowed by law. My employer did not contribute to this account at all. Since the early 1990’s until today, the account increased 6.38 times. Every dollar I contributed 20+ years ago is now worth $6.38. After I left this job, I never contributed to this account again. As a matter of fact, I didn’t even change the asset allocation of this account which was 25% invested in a TIAA fixed return annuity and 75% in the CREF stock fund. Notice the 14.4% return from January to September, 2013. That was lower than the return we would have earned had the asset allocation held more stock investments and less fixed. But for us, I like to keep a percent of our overall portfolio diversified into cash and bonds to smooth out the volatility, even if that hampers long term returns. During the previous 20 years since I left this job, there have been times when the value of this account went down and other periods when it went up. As John Bogle recommends, I didn’t pay much attention to the value, because I had no intention of withdrawing the funds. Had we not made the decision to struggle financially during those years, there is no way we would have the available assets we have today. To be perfectly honest, moving from Ohio to Southern California was a bit of a culture shock. As a “down to earth” girl, not overly obsessed with fancy cars etc., the So. Cal. environment was a shock. Everywhere you turned there was another luxury car. Appearances were very important! This didn’t make me feel bad, while I drove my Chevy Cavalier, but it surprised me. I knew I wanted to become wealthy eventually , and I understood that saving and investing was the way to get there. Well, saving, investing, and of course building up our earnings. I enjoyed our lifestyle and realized how lucky we were to live in beautiful Southern California. I’d be lying if I said there weren’t times when I wished we had more disposable income:). But overall, I appreciate our former financial choices as I see the great payoff today. That said, I don’t think we could have met our financial goals as easily had we not decided to move to a more affordable place to live while raising our daughter. This simple chart shows the power of leaving your money in the markets and letting it compound. 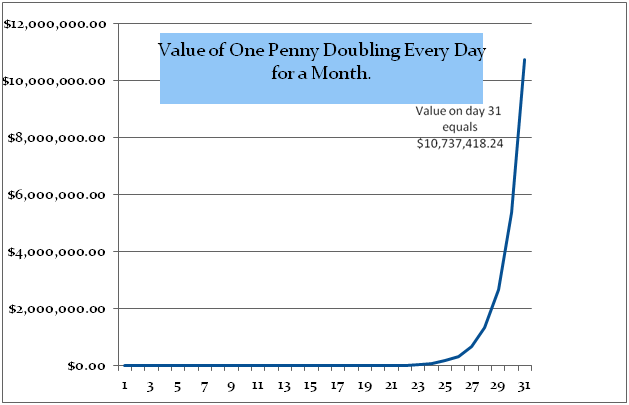 This is the value of 1 penny doubling every day for a month. On day 31, the doubling of the prior day’s funds equals over $10 million. Although you won’t find a 100 percent return anywhere legitimate, notice how it took quite awhile for the true benefit of the compounded growth to be realized. We continued to contribute the maximum to our workplace retirement accounts, IRA’s, Roth IRA’s, and 529 College Savings account. Nothing deterred us from our aggressive saving and investing. As our income grew, our lifestyle improved, but never went “over the top”. Not until recently have we experienced the explosion of growth from our compounded investing. All of our older accounts show the same type of growth as that initial TIAA-CREF workplace retirement account. Although, I wouldn’t have believed it at the time, the longer you leave your money in the markets to compound, the greater the growth. Time in the markets, even more than investment returns, is the greatest predictor of wealth from investing. In fact, Albert Einstein once commented that compound interest is one of the greatest wonders of the world. Time in the markets is the most precious commodity when it comes to investing. By leaving money in the markets to grow, the initial account contributions can multiply. Keep the money invested for a shorter period and there’s less time for the sum to compound. Even if you choose to expand into other investing, like p2p lending with lending club or with Motif Investing make sure you have time on your side when you are doing it. Decide whether you are willing to make a tradeoff. You can’t have everything now and later. Ask yourself if you’re willing to sacrifice a bit now for the likelihood of having more later. This is a guest post from Barbara Friedberg, MBA, MS, is a portfolio manager, former university finance instructor and publisher of the investing website, Barbara Friedberg Personal Finance.com. @free and @Mark- The benefit of starting early, no matter how much you invest, cannot be underestimated. Barbara, I know what you mean about Ohio. I have moved many times to different places, from my home state of Ohio and have found the spending habits of them to be very different. In regards to your article, would you say that starting early is even more important that what one invests in? For example, is it better to start earlier even if one is picking the wrong stocks? Hi Scott, There is no better investing strategy than starting early and investing regularly in a diversified portfolio of index mutual funds. The compounding of reinvested dividends and capital gains is the most powerful contributor to a fat retirement portfolio. #1. Investing early pays off big and the sacrifices are more than worth it. #2. If you could do it, anyone can save and invest some money starting today, no matter how small the sum. Investing early can really give you a lot of advantages like earning more over time. I’m glad I’m still young enough, and that I learned about investing early in my life. Great post, by the way. Hi Kieth and Jeff, Compound interest is like magic. Obviously, no one is going to get 100% return every day, as Jeff pointed out, the chart is illustrative. But you can invest in a diversified portfolio of stocks and bonds, receive an average annual return of 7% and over the years end up with hundreds of thousands of dollars. Specifically, start at age 25 and invest $300 per month in a retirement account (Roth IRA or 401(K). Continue for 40 years until age 65. At an average annual return of 7%, your $3600 annual contribution will grow to approximately $770,000. i am trying to make sense of the article and see how it motivates folks but i cannot put that chart out of my mind where suddenly in 2-3 short years the money balloon from less than 2 mil to 10 mil. how the heck can a savings that is not 100% equities do something like that? @ Kyith It’s just to illustrate a point. 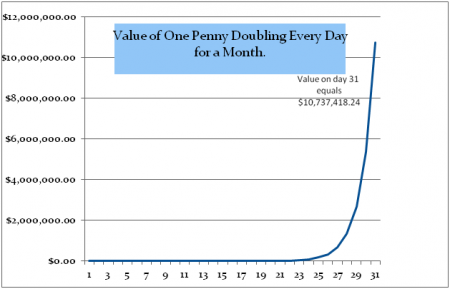 If you asked someone, “Would you rather have $5 million dollars or a penny that doubles every day for 31 days?”, I’m sure 98% of people would choose the $5 million. Simply because the don’t get the power of compounding interest. It’s the same reason when I meet with younger clients and encourage them to start saving $50-$100/month and, at first, they don’t see the point. I have to run then numbers to show what they are missing out on if they don’t start now. i understand the benefits of compounding but the illustration is strange.